When it comes to travel with a twist of magic and adventure, it doesn’t get much better than exploring the French Quarter on foot. It’s the heart and soul of New Orleans, a testament to its colorful past — a richly woven tapestry of different cultures, cuisines, musical notes, and its everlasting joie de vivre — still manifested ’round the clock in so many unique ways. Whether you’re on a quest to sample a savory Creole dish, dance the night away to a brass band, stroll the streets to admire the exquisite wrought-iron architectural details, or take in an eclectic street performance — this one-of-a-kind place has them in spades and pretty much around every corner. While it’s easy to come up with a longer list of must-see landmarks in a city this old and colorful, here are our top 10 recommendations, all located within walking distance from each other in the French Quarter. There’s only one exception — Frenchmen Street is located in Faubourg Marigny, right outside the French Quarter. This timeless landmark is located in the heart of French Quarter. Known since the 18th century as Place d’Armes, it was renamed in honor of Andrew Jackson following the 1815 Battle of New Orleans. Jackson’s bronze statue is the focal point of the square, surrounded by the lavish flora and facing the Mississippi River. Jackson Square is also a host to the open-air artist market and performance space, with local art displayed along the fence. You can have your sketch done, dance to a brass band, or have your fortune told. Carriage rides are offered in front of the square. When you cross the street to the riverside, you’ll find the French Market, Cafe du Monde, and Shops at Jax Brewery. St. Louis Cathedral is the oldest continuously active Roman Catholic Cathedral in the United States. It stands between its two historic neighbors, the Cabildo and the Presbytere, overlooking Jackson Square and the block-long row of the Pontalba Buildings. St. Louis Cathedral is one of the most instantly recognizable buildings in the world, its famous steeples showing up on many a postcard and in quite a few films. The Cathedral-Basilica of St. Louis King of France was built in 1724 and had been rebuilt twice after a hurricane and a fire. It was dedicated in 1794 and has enjoyed an illustrious and eventful history. One of its most famous caretakers was Pere Antoine, a popular Capuchin priest who had been pastor of the Cathedral from 1785 to 1790 and again from 1795 to the time of his death in 1829. You can check out the Cathedral’s stunning interior during its hours of operation, attend a mass or a music concert. If you’re just passing by, depending on time of day, you may get to hear its bell or witness an occasional wedding party spilling out of the Cathedral, followed by a second line. Did you know that the 1803 Louisiana Purchase was signed at the Cabildo? This historic building served as the seat of government during the Spanish colonial rule, and was built to replace the building claimed by the fire in 1794. Standing tall right next to St. Louis Cathedral, the Cabildo is now part of the Louisiana State Museum. 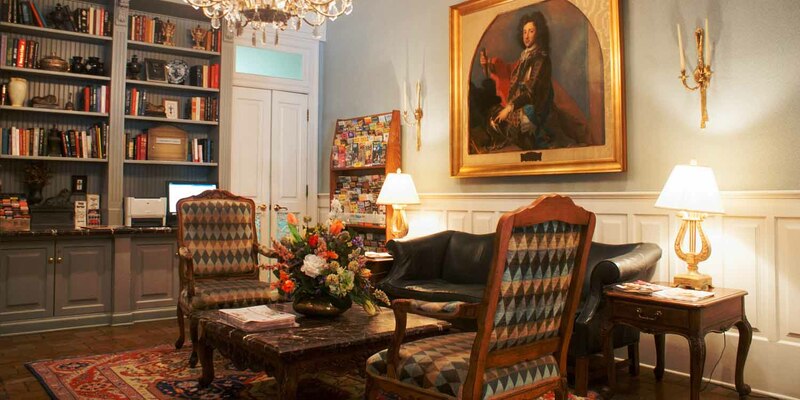 It houses such precious artifacts as a painting of Marie Laveau by Frank Schneider; a self-portrait by Julien Hudson, an antebellum artist and free man of color; and Napoleon’s death mask, one of only four in the world. 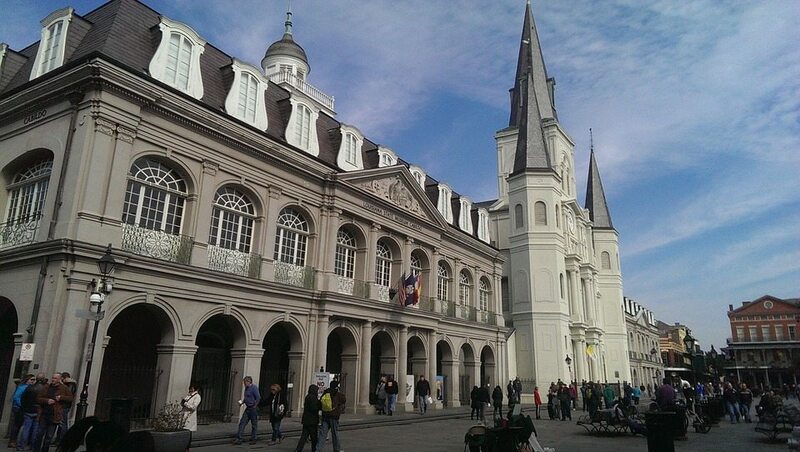 On the other side of St. Louis cathedral is the Presbytere, built in 1791 in the style to match the Cabildo. It’s called “Presbytere” because it was built on the site of one, which served as a residence for Capuchin monks. The building served as a courthouse in the late 19th century and is now also part of the Louisiana State Museum, just like the Cabildo. The Presbytere currently houses two permanent exhibits. The magnificent “Mardi Gras: It’s Carnival Time in Louisiana” tells the story of the Carnival traditions in Louisiana, including Cajun Courir de Mardi Gras, Zulu coconut throws, 19th century Rex ball costumes, and much more. “The Living with Hurricanes: Katrina and Beyond” exhibit documents the natural disaster, its aftermath, and the ongoing recovery with interactive displays and artifacts. French Market was founded in 1791 as a Native American trading post and has been operating continually since, making it the oldest public market in the country. Similar in structure to a traditional European market, this open-air mall covers roughly five blocks, from Cafe du Monde on Decatur St. across from Jackson Square to the daily flea market at the end of Esplanade Avenue. Many retail shops and restaurants surround it in every direction. The flea market area hosts dozens of local artisans, plus vendors from all over the world. You’ll find souvenirs, handmade masks and jewelry, t-shirts, music, and more. French Market also includes a small pedestrian plaza on Dumaine and St. Phillip streets called Dutch Alley. The food stands at the Farmers Market Pavilion offer a slew of spices, produce and local food that is uniquely New Orleans — from pralines to oysters to the beignet mix or the hot sauce you’d want to take home. The Farmers Market also hosts an annual Creole Tomato Festival to celebrate its harvest. You can access the mile-long riverfront very easily from the Jackson Square area. There you will find grassy Woldenberg Park and a walkway called the Moonwalk, named after the former New Orleans mayor Maurice “Moon” Landrieu. The Woldenberg Park is a popular spot to watch the 4th of July fireworks. It also hosts one of the largest stages during the annual French Quarter Festival, which takes place in the spring. Stroll along the Moonwalk to view public art, like the Holocaust Memorial, and to watch the boats go by. The riverwalk is also home to two popular family-friendly attractions, the Audubon Aquarium of the Americas and the Entergy IMAX Theater. That much is true: Bourbon Street is home to one of the wildest nightly street parties in the country. It’s well known for its karaoke and burlesque clubs, bars that never seem to close, and crowds milling about round the clock. This endless party vibe makes Bourbon Street a great destination for your bachelor party, a girls’ night out, spring break, a couple’s getaway — and any other cause for celebration. It is also one of the oldest streets in the country, a vivid example of Spanish colonial architecture dating back to 1798 and steeped in history, magic and legends. It’s also home to the city’s most iconic destinations like Galatoire’s and The Old Absinthe House. One of the best jazz clubs in the country, if not the world, also has a Bourbon Street address. Fritzel’s European Jazz Pub is located in a historic 1831 building and hosts live, traditional jazz performances nightly, attracting jazz aficionados from all over the globe. This ancient, at least by North American standards, bar is housed in a Creole cottage on the corner of Bourbon and St. Philip streets. Lafitte’s Blacksmith Shop was built between 1722 and 1732, and it’s said to be the oldest structure used as a bar in the U.S. It’s also said to have been used by the infamous Lafitte Brothers, Jean and Pierre, as a base for their smuggling operation in Barataria, operating as a facade for the privateers. We won’t likely know the truth beyond the legend, but the bar is dripping in magic and history, making is a popular destination for locals and visitors alike. The Old Ursuline Convent was built in 1752, which makes it the oldest surviving example of the French colonial period in the country, circa Louis XV. The building has first served as a convent for the Ursuline nuns, and then, as centuries ticked on, it had been, at some point: a school, an archbishop’s and priests’ residence, archdiocesan offices/archives, and is now part of the Catholic Cultural Heritage Center of the Archdiocese of New Orleans. Its museum is open for self-guided tours. Only one block away, running parallel to Bourbon Street, Royal Street presents a very different scene — a mix of performance art, live music on the corners, eclectic art galleries, funky boutiques, and upscale antique shops. The French Quarter part of Royal Street stretches for 13 blocks, from Esplanade Avenue to Canal Street, and the stretch between St. Louis and St. Ann streets is a pedestrian mall closed to traffic from 11 a.m. to 4 p.m. daily. The scenic street is also known for its wrought-iron balconies and other charming architectural details and lush courtyards, including those featured by the street’s many restaurants. Consider having a cochon de lait in Cafe Amelie’s well-appointed courtyard, or Bananas Foster in Brennan’s stunning outdoor seating area. Among the notable art galleries are Harouni, 933 Royal St., featuring the artist’s own work; and George Rodrique Studios, 730 Royal St., with his ubiquitous Blue Dog paintings on display. As for shopping for antiques, from the exquisite chandeliers to rare 17th century furniture to fine art and jewelry, Royal Street also got you covered. M.S. Rau Antiques, 630 Royal St., for instance, is considered one of the best destinations in the world for antique shopping. Frenchmen Street is a three-block area with one of the best and most densely packed live-music venues and restaurants in the city. It’s located in Faubourg Marigny, right next to the French Quarter, featuring more than 20 bars and clubs, plus a night art market, a smattering of diverse restaurants, and live music on street, especially at night. Jazz, brass, funk, DJs — you name it — and it’s playing on the corner somewhere on Frenchmen. Some of the city’s best clubs are located on Frenchmen and offer live music seven nights a week, day and night. The Maison, for example, has three floors and a packed late-night show calendar, but also a lively Sunday jazz brunch. Dragon’s Den offers a diverse and eclectic mix of music on its two live music stages, plus the lure of a courtyard and a balcony for a more relaxed experience. Marigny Brasserie’s outdoor seating is as elegant as it is perfect for people-watching. Three Muses and Snug Harbor Jazz Bistro are the dinner-and-a-show kind of places that focus on Creole and regional cooking, and D.B.A.’s roster of the world-famous musicians who have played there is legendary. For smaller venues and more intimate ambiance, you can try The Spotted Cat or the cozy, divey Apple Barrel. Finally, top off all the blues and funk with Adolfo’s Creole Italian cooking, from a tiny old-school restaurant directly above the Apple Barrel. When you’re done with the hustle and the bustle of the French Quarter and the Marigny, come have a handcrafted cocktail at the Bombay Club or a bite to eat at Cafe Conti at the Prince Conti Hotel. 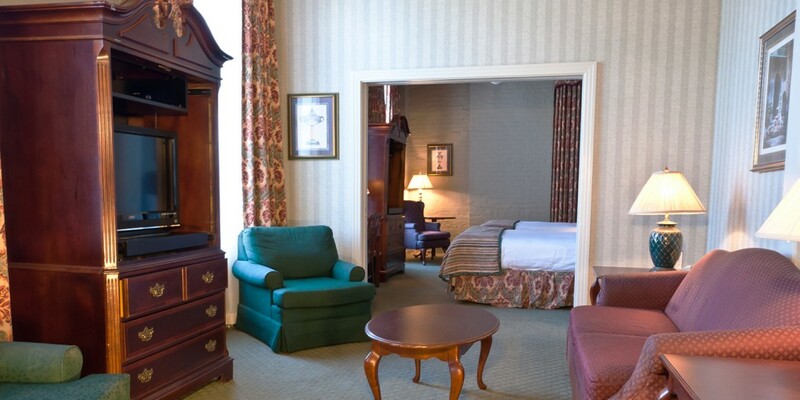 Although it’s located in the heart of the historical French Quarter, just steps away from its most exciting sights and destinations, Prince Conti offers a quiet respite from it all, an oasis with an elegant yet relaxed vibe.